Since 1877, Tintern Grammar has been a leader in the fields of teaching, learning and the care of all our students. Set on 40 acres of beautiful tree-lined grounds, Tintern has magnificent sporting fields, state-of-the-art facilities and a working farm. Tintern encompasses the parallel learning model, which sees students educated in both co-educational and single gender settings according to their age and stage. Our younger students learn in separate gender classes at an age when gender tends to play a greater role in influencing learning styles. This allows us to tailor our teaching methods to create the optimal learning and pastoral environments to support each child. Our students feel more confident to take risks, be academically courageous and challenge themselves in a supportive and nurturing environment. Students are introduced into co-educational classes when social development is an important part of their growth and maturation with the move to more inquiry based and independent learning, as they prepare for future study and work pathways. 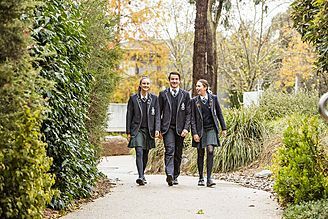 Providing both single gender and mixed classes on a co-educational campus gives families the perfect balance between the academic and social development of their children and supports the development of young women and men of strong character who seek excellence and strive with confidence towards their future. 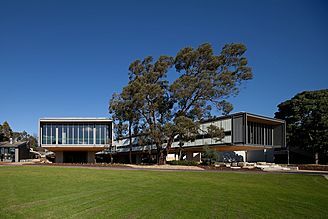 Our purpose built Senior College provides three study pathways for students: VCE, International Baccalaureate (IB) and VCE/VET. The IB Diploma is a two-year curriculum undertaken in Years 11 and 12. 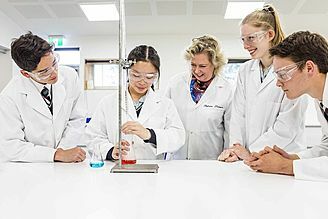 IB provides an alternative to VCE, focusing on independent research and essay writing, and has a distinct emphasis on educating the whole person. Strong emphasis is placed on the ideals of international understanding and responsible citizenship. The IB Diploma is recognised by all Australian tertiary institutions and major universities worldwide. Tintern is the only school in the region to offer this globally renowned study pathway. Our VCE/IB results are among the top in our region with 29% of our 2018 Year 12s achieving an ATAR of 95 and above and 40% achieving an ATAR of 90 and above. We are committed to meeting the needs of all our students. This includes challenging gifted children through Horizon, an extension program for students who display an enhanced level of learning. We offer students a broad range of co-curricular activities, including sport, outdoor education, young farmers, performing arts, debating, music and much more. At Tintern Grammar, we are proud to have offered the International Baccalaureate Diploma Program (IB) for over 20 years. The IB Diploma is a two-year curriculum undertaken in Years 11 and 12. Tintern’s VCE/IB results are among the top in our region. 21% of Year 12 IB students achieved an ATAR conversion of 99 and above. 32% of Year 12 IB students achieved an ATAR conversion of 98 and above. 69% of Year 12 IB students achieved an ATAR conversion of 95 and above. 95% of Year 12 IB students achieved an ATAR conversion of 90 and above.